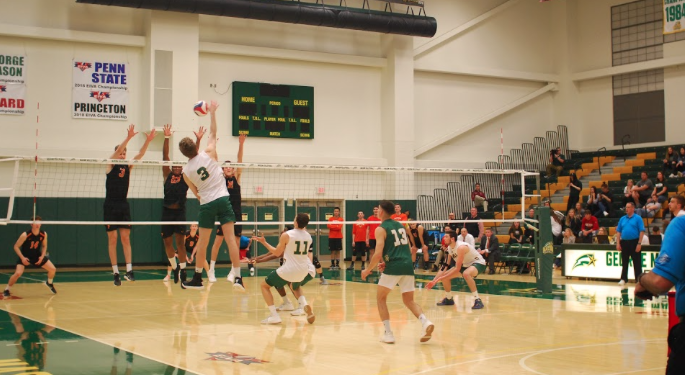 The Patriots’ men’s volleyball team entered the Eastern Intercollegiate Volleyball Association (EIVA) Tournament on Thursday, April 19, as the number one seed, looking to win and earn a NCAA bid on Saturday in the championship game. Unfortunately, the Patriots struggled to overcome the Princeton Tigers and lost 3-1 in four sets. The loss was the third time this season that the Patriots played Princeton, and Mason won both of the previous two matches. 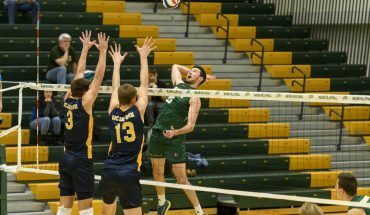 The Patriots were 13-1 in the EIVA conference coming into the tournament, but suffered only their second conference loss on Thursday. The Patriots struggled as a team, with 32 attacking errors compared to the Tigers’ 16 attacking errors. Both teams had exactly 51 kills and 48 assists throughout the four sets. Princeton had more blocks than the Patriots, recording 28 compared to Mason’s 21. Mason will also have to prepare for three of their biggest playmakers, Johnny Gomez, Christian Malias and Brian Negron, graduating before the next season. Coach Hosack stated that even though the seniors were disappointed, they had left the program in great hands with the younger players on the team. “They lead by example, they didn’t beat their chests, they showed the young guys what it takes to be successful here,” Hosack said when asked how the seniors have made an impact on the underclassmen in the program. Senior Christian Malias lead the team with 13 kills throughout the match, but struggled with a hitting percentage of .129. Though he had a decent offensive performance, he still held himself accountable for the crucial plays he failed to execute successfully. The Patriots’ loss to Princeton ended their season, But they leave with hopes to make it back to the tournament again next season. A full transcript of the Post-Game Press Conference is available here.